Wheatgrass is a nutrient rich young grass in the wheat family. Wheatgrass is grown from wheat seeds and contains high levels of chlorophyll. Usually people choose to juice with Wheatgrass but it is also available in supplement form. A one ounce serving of Wheatgrass has no fat, only seven calories and virtually no carbohydrates or protein. Neither does wheatgrass contain any essential omega-3 fatty acids nor is it rich with vitamin content except for vitamin C.
So, what’s all the hype about wheatgrass then? The magic is Chlorophyll…the green pigment that increases the blood’s oxygen content and whose role is critical in photosynthesis (the process which allows plants to absorb energy from the sun). Wheatgrass juice is one of the best sources of living chlorophyll available today but in order to get the full benefit the chlorophyll must come from a living plant. Chlorophyll helps rid the body of toxins, improves the health of the digestive track by improving the micro-flora ecology. 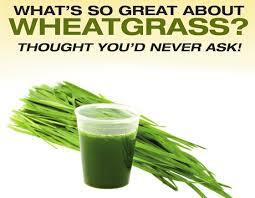 Wheatgrass provides brings down blood pressure and steps up the red blood-cell count. It works to clean the blood, organs and GI tract of debris. Taken daily, wheatgrass has been demonstrated to energize metabolism as well as the body’s enzyme systems by enriching the blood. It also aids in bringing down blood pressure by dilating the blood pathways throughout the body. Wheatgrass taken in juice form (the most popular way to acquire your daily wheatgrass nutrition boost) energizes the thyroid gland serving to correct health problems like obesity, indigestion, and a horde of additional complaints. One of the biggest benefits of enjoying a glass of wheatgrass juice on a regular basis is its ability to aid in restoring alkalinity to the blood. The abundance of alkaline minerals helps cut down over-acidity in the blood. Many people turn to wheatgrass because of its reputation as a potent detoxifier offering crucial protection for the liver and blood. Studies show that the enzymes and amino acids found in wheatgrass may protect us from carcinogens like no other food or medicine. It beefs up our cells, detoxifies the liver and bloodstream and chemically counteracts environmental pollutants. Recent studies demonstrate that wheatgrass juice has the potent ability to battle tumors without the common toxicity of drugs that likewise subdue cell-destroying agents. Scientists have also discovered that wheatgrass juice holds beneficial enzymes. Enzymes are at work whether you’ve got a cut that needs healing or weight that needs losing. Enzymes do the real work. Do not cook your wheatgrass…you can only garner the advantages of the many enzymes offered by wheatgrass by eating it uncooked. Cooking will demolish 100 percent of the enzymes in food. The nutritive value of freshly juiced wheatgrass carries remarkable similarities to our own blood. An important facet of chlorophyll is its noteworthy likeness to hemoglobin the compound that transports oxygen in the blood. Don’t forget, chlorophyll is the first product of light and contains more light energy than any other food element and science has proven that chlorophyll arrests the growth and development of unfriendly bacteria. The reason many people are using wheatgrass as food and medicine is that since chlorophyll is soluble in fat particles and fat particles are soaked up directly into the blood via the lymphatic system that chlorophyll may likewise be soaked up this way. In other words, when the blood of plants is soaked up in humans it’s transformed into human blood which channels nutrients to every cell of the body. And, that’s a good thing! If you simply want to find how you fair on the Weight Loss Resistance Scale you can take my 60 second test. How You Fare on the Weight Loss resistance scale.